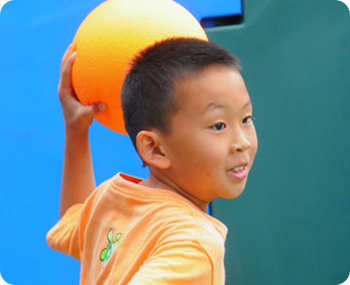 We are pleased to offer our campers lunch and snacks at no additional cost. 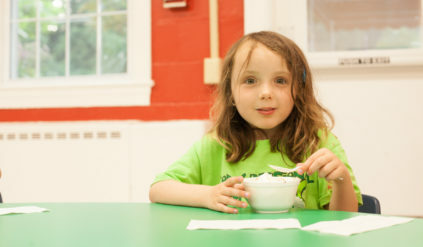 Campers in the Great Adventures division are offered morning and afternoon snacks and counselors assist them at lunch, which is served family-style. 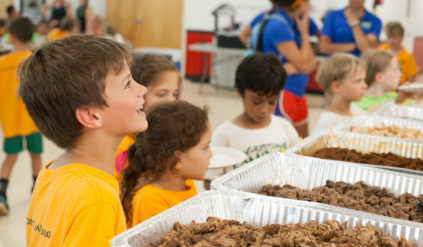 For all other campers who are provided a lunch, in addition to the regular entrée, there is a peanut butter and jelly express line, salad bar and fresh fruit. Milk and water are also available to all campers. An afternoon snack time is built into each group’s schedule. We also provide a morning snack of different fruit options to enhance our healthy offering. 2019 Lunch and Snack Menus Coming Soon!